that places them on equal footing with their employers. that their interests are important and protected. of success in counselling, negotiations and litigation. For discreet and confidential legal advice regarding their most sensitive employment issues, business executives and professionals across the Chicagoland area look to attorney Ruth Major. Ms. Major is uniquely qualified to represent executives and professionals in all aspects of employment law. Having represented first-tier employers and employees, Ms. Major understands both sides and uses that unique perspective to the advantage of her clients. As a chief attorney in the employment law department of a large corporation in Chicago, Ms. Major was involved in handling a wide range of employment matters as an insider, including participating in decision-making that affected executives at the highest levels. She now applies the invaluable knowledge and experience she has acquired representing blue chip employers for the benefit of executive-level employees and small businesses. The Firm's practice focuses on providing counsel to business executives, physicians, attorneys and small businesses on a myriad of employment issues including employment contracts, separation agreements, restrictive covenants including non-compete and non-solicitation provisions, and compensation issues including employee incentive plans. She has represented clients in a wide range of industries including financial services, education (including colleges and universities), healthcare, manufacturing, advertising, energy, government, retail, software and internet, media and entertainment, non-profit, and real estate and construction, among others. Ms. Major's primary goal in representing her clients is to understand their priorities and tailor her representation to their objectives. Ms. Major has established long-lasting relationships with many clients, assisting them with their employment needs through the years. Ms. Major is also an experienced litigator, having successfully represented clients in complex cases on behalf of individuals and corporations throughout the country in state and federal courts, before administrative agencies and in arbitration. She is licensed in Illinois, has been a member of the federal trial bar in Chicago for more than 20 years, and is admitted to practice law as an attorney and counselor in eight federal district courts across the country. 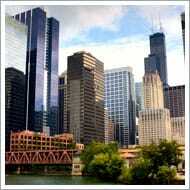 Ms. Major has also been recognized by her peers as one of the top employment lawyers in Illinois. For the past eight consecutive years (2012 through 2019) she has been selected for inclusion in both the Illinois Super Lawyers® and Illinois Leading Lawyers in the area of Employment Law. A very small percentage of attorneys are selected for both distinctions. Super Lawyers is a rating service of outstanding lawyers from more than 70 practice areas who have attained a high-degree of peer recognition and professional achievement. The selection process is multi-phased and includes independent research, peer nominations and peer evaluations. Leading Lawyers are selected by the Law Bulletin Publishing Company based on independent research and peer surveys. Ms. Major was also selected for inclusion in the Top Women Attorneys in Illinois for 2012 through 2019 and is recognized as a Leading Women Lawyer in Illinois for years 2012 through 2019 as selected by the Leading Lawyers Network for being among those lawyers who were most often recommended by their peers in statewide surveys. Only 5% of the attorneys in Illinois are named to the Super Lawyers, only 5% are named to Leading Lawyers, and fewer than 2% of women attorneys in Illinois are named to the list of Top Women Attorneys. In March of 2017, Ms. Major was elected a Fellow of the American Bar Foundation. The Fellows of the American Bar Foundation is an honorary organization of attorneys, judges, law faculty, and legal scholars whose public and private careers have demonstrated outstanding dedication to the welfare of their communities and to the highest principles of the legal profession. Membership in The Fellows is limited to 1% of lawyers licensed to practice in each jurisdiction. Members are nominated by their peers and elected by the Board of the American Bar Foundation. Ms. Major is also a former Fellow and a current Fellow Alumni Class Representative for the Public Interest Law Initiative, which is a well-respected non-profit in Chicago dedicated to cultivating a lifelong commitment to public interest and pro bono service within the Illinois legal community with the aim of expanding the availability of legal services for people, families and communities in need. Ms. Major was also selected as a ACQ Global Awards category winner for US (Midwest) Employment lawyer of the year for 2014 and The Law Offices of Ruth I. Major was selected as a category winner for US (Midwest) Employment Law Firm of the year for 2014. 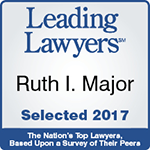 Ms. Major is also a category winner in the US Leading Lawyers section and the Firm is an overall category winner for 2014. For the last 11 years, ACQ magazine has established itself as the leading monthly title for the M&A advisory community, requested by over 106,000 senior executives in the market and providing them with a regular snapshot of industry activity that has taken place around the world. For the past eight years, the ACQ Global Awards have been celebrating achievement, innovation and brilliance in their annual awards. This is an independent nomination process with the award winners chosen by the industry itself. All category winners in the ACQ Global Awards 2014 represent this ethos. Ms. Major is rated Superb by Avvo (10 out of 10), a firm that independently rates lawyers using a mathematical model to ensure consistency, and she has been selected by the Ten Leaders Program as one of the top ten lawyers focusing on Employment Law in Chicago Region. Leaders are chosen in the areas of law, medicine, finance, architecture and technology based on independent and unsolicited research. Ms. Major is a popularly acknowledged authority on employment matters and has been cited as an authority on employment issues by, among others, The Chicago Tribune, Crain's Chicago Business and The Wall Street Journal MarketWatch. Major media and legal outlets across the country such as the ABC News, NBC News, The Today Show, The Chicago Tribune, The Chicago Sun-Times and The Chicago Daily Law Bulletin have reported Ms. Major's achievements with respect to employment law matters. A detailed listing of Ms. Major's media involvement can be read here. To confidentially discuss your employment-related legal matter with attorney Ruth Major, contact her downtown Chicago, Illinois, office by calling 312-893-7544. You can also contact her firm online to schedule an appointment.